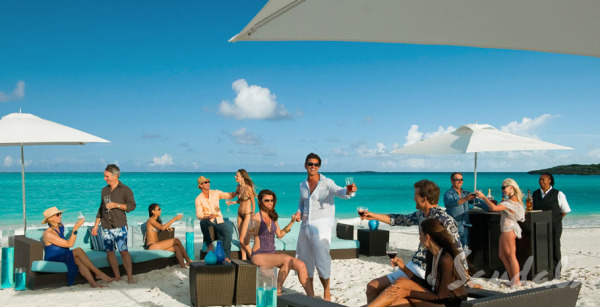 Sandals Emerald Bay is one of the newest, most exclusive and chic resorts in the Caribbean. 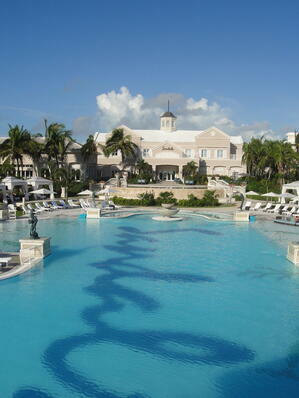 This resort is located on an out island of the Bahamas called Great Exuma. The Exumas are considered to be the French Riviera of the Caribbean; their calm aquamarine bays and beautiful beaches rest just 130 miles southeast of Nassau, Bahamas. A mere 40 minutes by plane from South Florida, the 365 tiny islets and cays that comprise The Exumas feel as though they are a million miles away from anywhere. 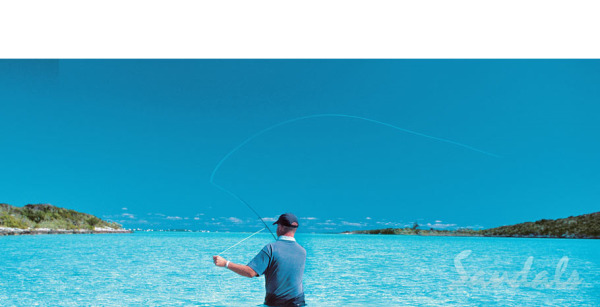 Deep within the pristine Bahamian Out Islands, their waters are revered the world over for their diving, fishing and yachting. Upon arrival at Georgetown International Airport, after exiting Customs and Immigration, just look for the Sandals Welcome Host. 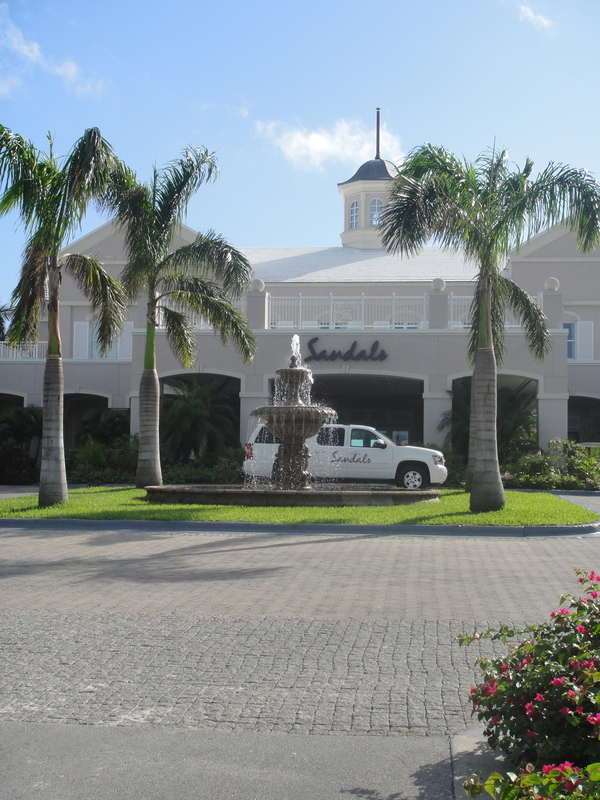 Your complimentary transfer to and from the resort is arranged by Sandals, so climb aboard your air-conditioned bus and enjoy a brief 10-minute ride to Sandals Emerald Bay. Once you arrive at the resort, you'll be greeted like all Sandals guests, with a glass of champagne, a cold towel and a warm smile. Deep within the idyllic waters of the Exumas, Sandals Emerald Bay brings unprecedented luxury to the easy-going rhythms of the Bahamian Out Islands. Here, civilized pleasure coexists with exotic adventures amidst 500 tropical acres along a pristine, mile-long beach, which ensures you will feel as if you are the only ones there. 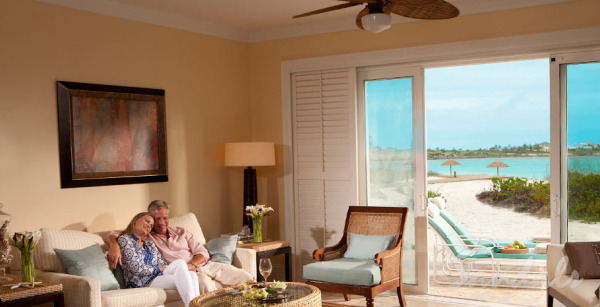 Service reigns supreme, and Bahamian-style architecture of elegant villas and suites harmonize with nature. This resort boasts three impressive pools including a half-acre, zero-entry pool with dramatic fire pit in the middle. You may play championship golf on a Greg Norman-designed course, voted one of the Caribbean's Best by Travel & Leisure Golf or relax in the first-ever 16,000 sq. ft. Red Lane Dermalogica concept spa. Over 13,000 sq. ft. of covered banqueting and convention facilities. Down duvets and pillows; personal pillow menu; flat screen televisions with cable connections; DVD players on request; electronic in-room safe; hairdryer; emergency overnight toiletry kit; lighted make-up/shaving mirror; luggage rack; individual temperature control; robes; iron and ironing board; smoke and heat detectors; night lights; two line speaker phones with data port and I-home deck with an alarm clock. All suites include double marble vanity sinks, glass enclosed shower and a deep soaking tub. Your wish is our command. With the uncompromising attention of a personal butler trained to the highest standards by the elite Guild of Professional English Butlers, you will be pampered throughout your stay in extraordinary ways. 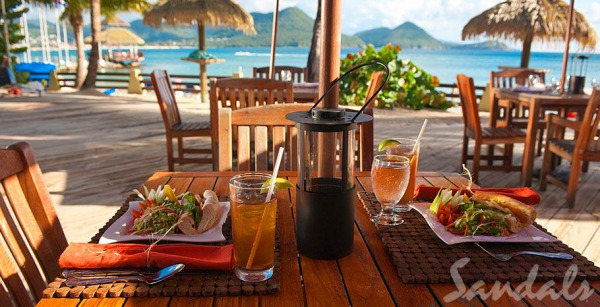 From unpacking and packing your luggage, attending to your wardrobe, serving a glorious breakfast on your terrace, and many more surprises, a Sandals Suite complete with your own personal butler, is the ultimate indulgence. More on Personal Butler Service here. 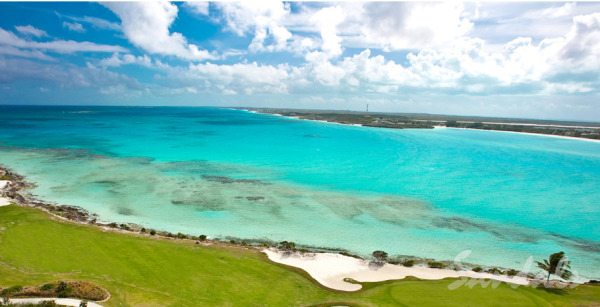 “Built along a headland on the eastern shores of Great Exuma, the Emerald Reef course is the Caribbean's answer to Pebble Beach in California. 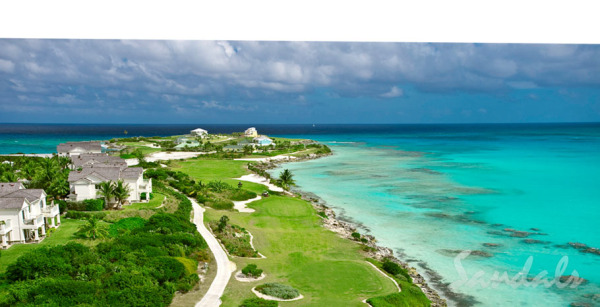 In fact – and whisper it quietly – with six signature holes that hug the ocean, for sheer aesthetic appeal, this Bahamian course might even surpass it." Most public areas of this hotel, and all of the rooms, have Wi-Fi coverage for your convenience. Instant access to the Internet may be obtained by simply connecting to the network, and wi-fi is included with every room at this resort. Top-of-the-line equipment for scuba diving is included for certified divers; however, you're welcome to bring your own. You must remember your diver certification cards to enjoy full diving privileges. If you have any contra-indications to diving you must have a doctor complete and sign the physician section on the medical questionnaire form before you will be allowed to dive at any of our resorts. When we think of Italian cuisine, we tend to imagine one singular cuisine representing the entire country. 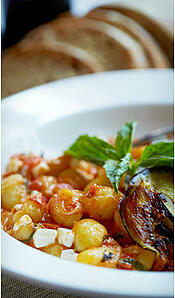 In reality, Italian cuisine is made up of 20 diverse regional cuisines, each with its own unique ingredients. 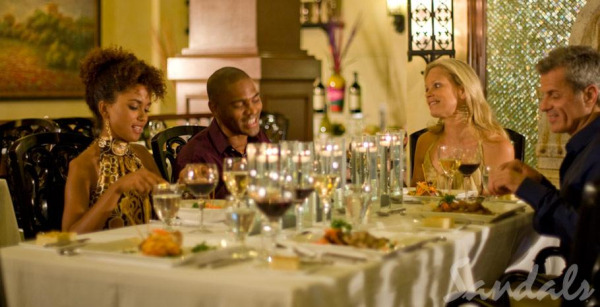 At Sandals resorts, you will find Italian restaurants specializing in cuisine from a specific region of Italy such as Veneto, Emiglia-Romagna, Toscana, Lazio, Campania or Puglia. So, you can enjoy a tour of Italy without ever leaving the Caribbean. 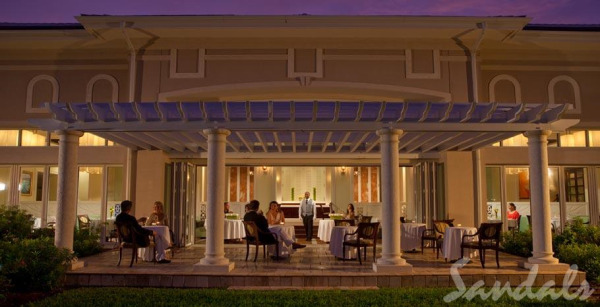 IL CIELO (Sandals Emerald Bay, Bahamas) means Heaven or Paradise in Italian - an apt description of the ultimate dining experience this restaurant offers. Heavenly Tuscan specialties like Osso Buco Brasato and Risotto ai Frutti di Mare are delivered by white-gloved servers in an elegant atmosphere with expansive views of Emerald Bay. After dinner, there’s excitement in Il Cielo’s Dolce Lounge as expert pastry chefs put on a show making plating up Italian desserts and scooping out generous helpings of Italian gelato. 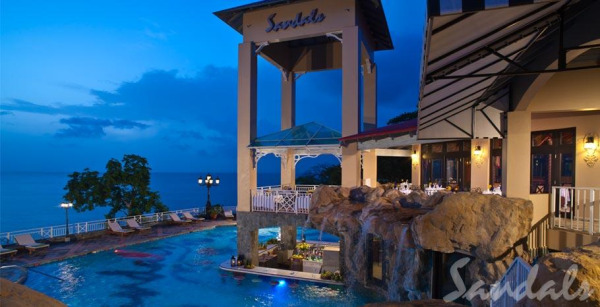 Armando's (Sandals La Toc, St. Lucia) restaurant is named after one of Italy's most celebrated military heroes, Armando Diaz - the general who led the Italian troops in the Battle of Vittorio Veneto, which ended WWI on the Italian front. As payment for his efforts, Benito Mussolini named him Minister of War, and he was promoted to Field Marshal. Upon retirement, in 1924, he was given the honor of Maresciallo d'Italia, Marshal of Italy. In tribute to General Diaz, Armando's restaurant serves specialties from him home region of Campania including the mouthwatering linguine and cams in white wine sauce, "Linguine Alle Vongole." You are invited to join Scott Wilson, P.G.A. Professional, for an extended weekend of golf and vacation. Come experience the most beautiful Greg Norman Championship Golf Course in the Caribbean and relax and recharge with friends. For more information, please Contact Us and let me know that you are interested in joining our golf group. 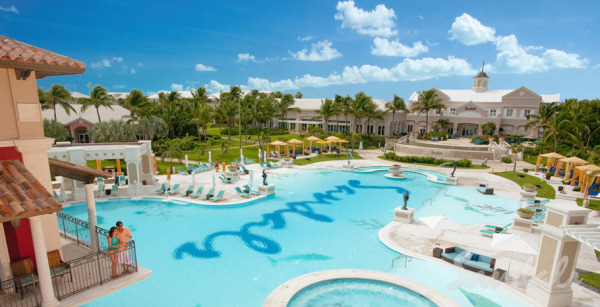 Once our workshop at Sandals Royal Bahamian had concluded, Robbie pulled a few strings and we were lucky enough to get to stay a night at Sandals Emerald Bay - the more recently acquired of the two Sandals resorts in the Bahamas. This was a TREAT! 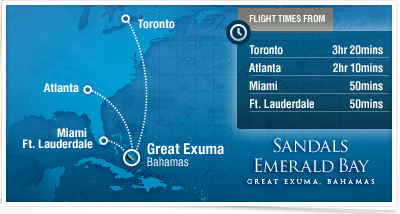 Sandals Emerald Bay is an exclusive resort on a small island - Great Exuma. 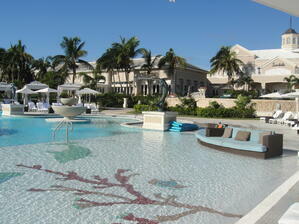 Unlike Nassau, there is very little development on the island other than Sandals Emerald Bay. In fact, there are no stoplights on Great Exuma. Sandals Emerald Bay's most notable features are a Greg Norman golf course, an untouched 2 mile stretch of beach, and the most impeccable service I have ever experienced. 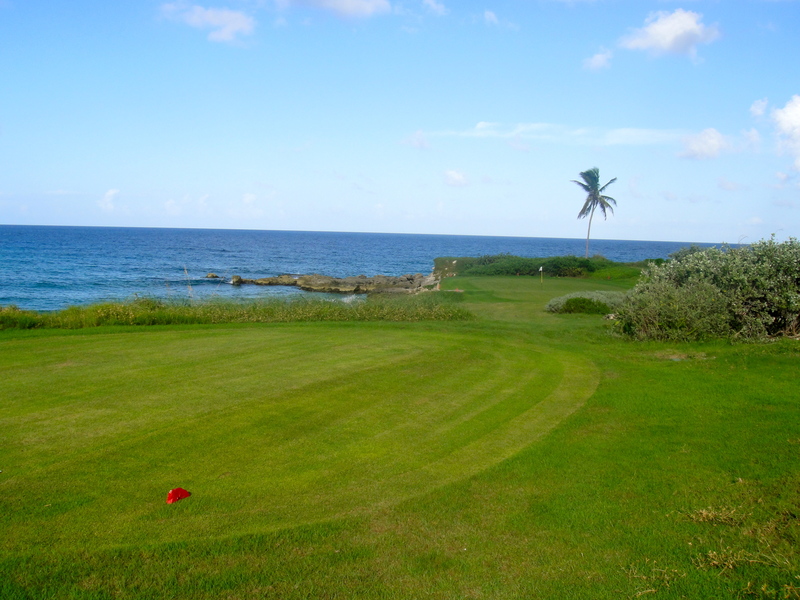 The 18 hole Emerald Reef Golf Course boasts some of the most amazing views in the Caribbean - especially from a tee box. This is a well-kept par 72 Championship course designed by Greg Norman. The western end of the island is a long peninsula that curves in just a bit to form Emerald Bay. As you play through the first part of the back nine holes, you travel out to the tip of the island on the back side of the peninsula. Here, the waves crash against the rocks below, and you may catch a glimpse of the yachts in the 150-slip deepwater marina. As you play through the last few holes of the course, you will come around to the bay side, and you are greeted with a breath-taking panoramic view of the resort. 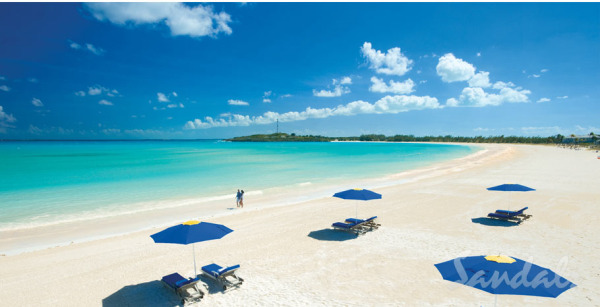 Sandals Emerald Bay also offers 6 lighted Har-Tru tennis courts including a sunken stadium court. The tennis pro usually offers a complimentary tennis lesson to guests and is available to help coordinate matches. The magnificent Red Lane Spa facility includes separate men's and women's locker rooms and relaxation rooms, 16 peaceful treatment rooms and a state of the art fitness center. 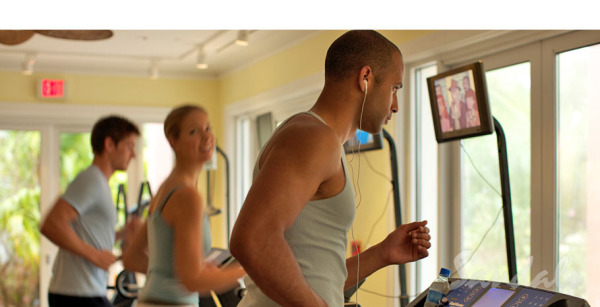 Yoga, aquacize and personal training sessions are available through the fitness center. But you need not be a golfer or play tennis to find your perfect getaway at Emerald Bay. The resort's 2 miles of powdery white sand beach and the Bahama's signature turquoise water is any beach-lover's paradise. I highly recommend a room in one of the Beachfront Villas, which are painted to match the brilliant color of the bay. This is the true Emerald Bay experience. 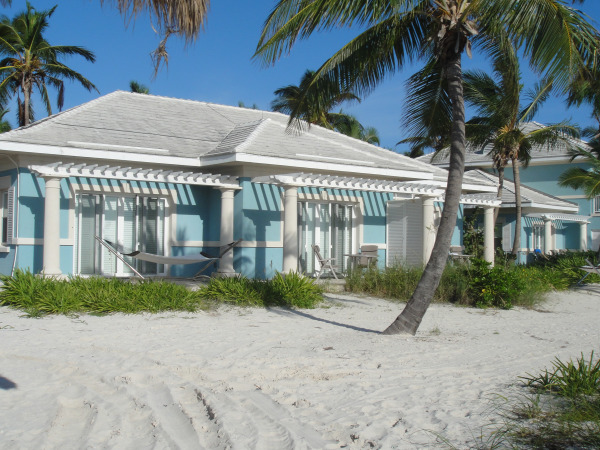 The rooms on the ground floor of the villas each have patios which step right off in to the sand. The beach here is so long, staying in the villas feels as if you have your own private beach. The rooms on the 2nd floor of the villas have balconies with gorgeous ocean views as well. My recommendation is the Prime Minister Honeymoon Beachfront Walkout Suite. These are on the first floor of the villas and each has a private hammock, which is perfect for stargazing. Because this island has no city and very little ambient light, the stars are bright and fill the night sky. This is a very special vacation. 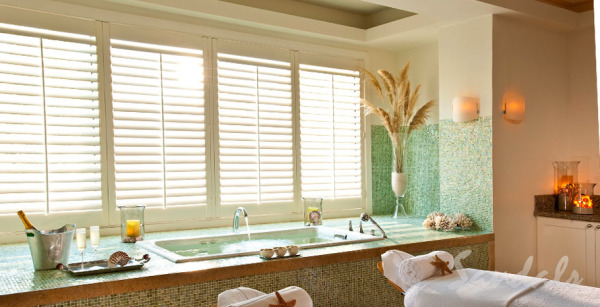 The suites at Sandals Emerald Bay each have double marble vanities, glass enclosed walk-in showers, deep soaking tubs, and espresso machines. Some even have walk-in closets. The hotel facilities are new and fresh and beautifully designed. There are two pools on the property - a quiet one just past the zen garden and reflecting pool - and a more lively one - the Caribbean's largest zero entry pool at one-half acre. This pool is a destination in itself. It has a large swim-up bar, integrated hot-tub, and an elevated fire pit. 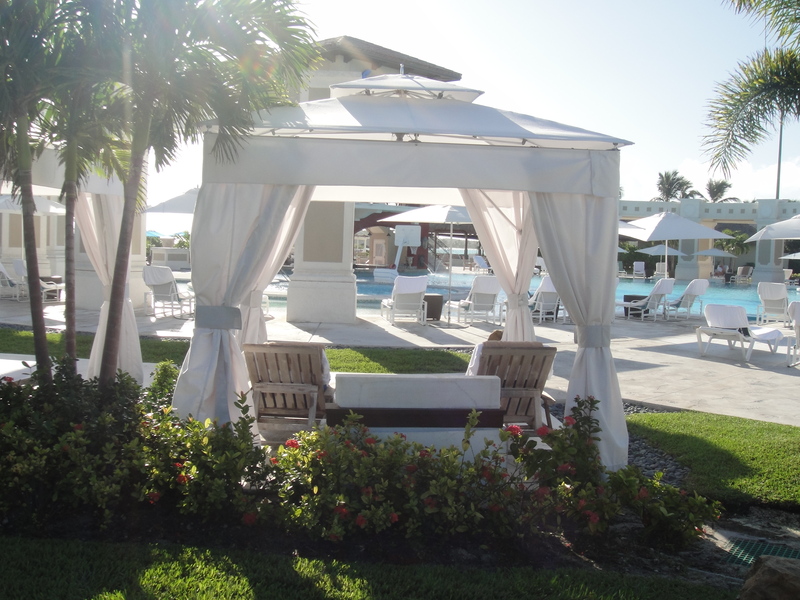 Both pools are surrounded by pairs of cushioned chaise lounge chairs, some with umbrellas and others under draped cabanas. The larger pool even has ratton-style couches just in the water with over-stuffed cushions and pillows so you can sit with your toes in the water and admire the view of the ocean and the sky from the pool. If you are looking for a getaway to lounge by the pool and read a good book, spend time reconnecting with your loved one, or take a nap in the shade, this resort does it better than you can imagine. 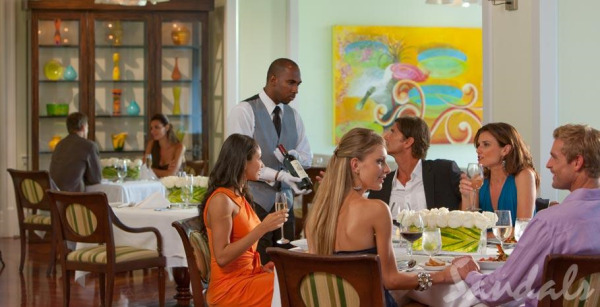 The culinary experience at Sandals Emerald Bay is unrivaled in the Caribbean. Whether you crave an evening of sophisticated conversation and fine dining, the barefoot elegance of oceanside dining, a refined afternoon tea, or a lively night at an authentic English pub, seven unique restaurants offer a cuisine and atmosphere to suit every mood. During our stay, we had a lovely, quiet breakfast at Bahama Bay, a casual dining setting that offers buffet dining experience three meals a day with nightly themed dinners. We enjoyed a Caribbean-style seafood lunch with our toes in the sand at Barefoot by the Sea, one of Sandal's signature restaurants. Sitting at picnic tables under thatched roofs on the beach with cloth napkins, we enjoyed delicious conch fritters and grouper sliders. 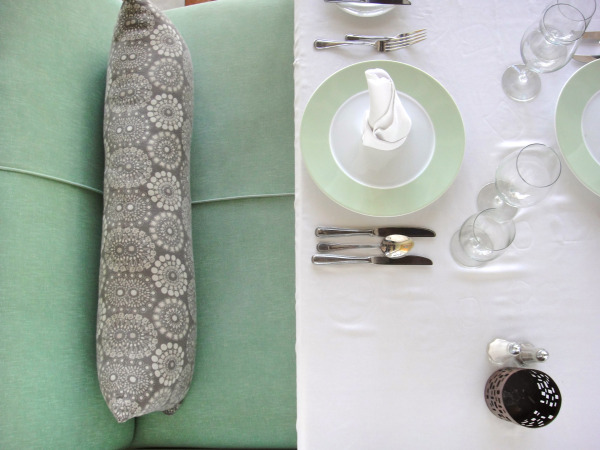 When we arrived on resort, our butler secured an 8:00pm dinner reservation at Il Cielo, the Italian restaurant requiring reservations, on our behalf. So, in the early evening, we stopped at the Drunken Duck, the resort's English Pub, for hot wings and beer. I would not usually order hot wings in the Caribbean, but we had heard these were exceptional, and we were NOT disappointed. When we walked through the doors of the Drunken Duck, it was as if we had been transported to the UK. This pub is authentic from the British manager to the Guinness on tap and New Castle in the bottle. Once we'd had our snack, and enjoyed the sunset from the couches in the pool while we finished our drinks, we headed to our suite to get ready for dinner. We were early - 8:00pm dinner is a little late for these East TN girls - so we had a drink in the Il Cielo bar while we waited. The ceiling in this bar a restaurant is at least 20 feet high and painted the color of the Caribbean sky. (Il Cielo is Italian for the sky.) The bar in this lounge is tall and mahogany with a marble top. The lighting is sophisticated and modern. We could tell we were in for a treat. Of course, once the hostess at Il Cielo knew we were there, she offered to seat us immediately. Our waiter was a proper but friendly young Bahamian studying biochemistry at the university on the main island. (The adult literacy rate in the Bahamas is 95%. Impressive.) We enjoyed a five course meal complete with a pasta course of the most amazing risotto I have ever had. If you've ever had risotto (or if you've ever watched Hell's Kitchen), you know, it is hard to do right. And as the daughter of travel agents, I've had the privilege of dining in fine restaurants in many countries. I know, this is a lot of sentences to cover a pasta course, but I want you to understand, this was Fabulous! And after that build-up, the entrée course was no disappointment, either. The Snapper tempura I had was very good. Robbie had Sea Bass, which she used the adjective "succulent" to describe. (She also noted that she is pretty sure she has never used the term succulent to describe food before.) After the entrée course, we knew we were experiencing something remarkable, and we asked our waiter to send our compliments to the chef. A few minutes later the handsome, young Chef Francesco of Bologna appeared at our table to thank us for the compliment. 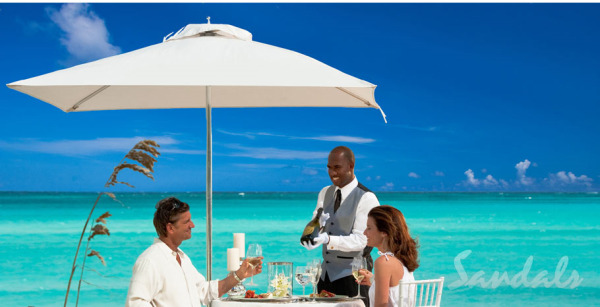 This is an important point that sets the Sandals resorts apart from their peers. Their themed restaurants are authentic from the decor to the menu because they are run by master chefs originating from the theme country. And last, of course, an extravagant dessert course was served, and we were apologetic that we only had room for a taste. 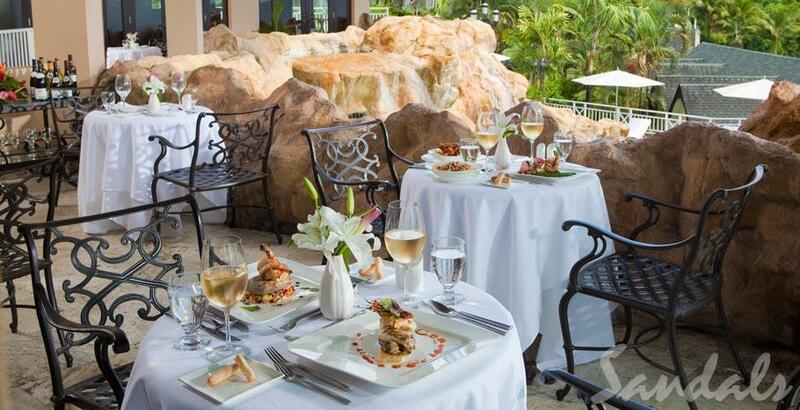 Other restaurants at Sandals Emerald Bay include La Parisienne - the French fine dining restaurant requiring reservations, and Café de Paris (pronounced like the French), which serves espresso, pastries and hand-dipped ice cream or gelato. Dino's Pizzeria serves made-to-order pizzas from a wood-fired oven for lunch and dinner, and room service is available to all rooms any time. There are so many details I'm leaving out here, but you really need to experience this resort for yourself. If you are a golfer, a beach-lover, or if you just appreciate great service, this resort is not to be missed!